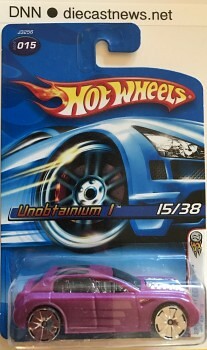 Part of my personal collection, this Hot Wheels Unobtainium 1 was released as part of the 2006 First Editions Series in 2006. Variations: – YES – according to reference materials there are at least three variants of this series/model. If you are looking for information regarding Hot Wheels variations please check out the books and guides we use as reference. FUN FACTS! – There have been 3 limo body styles in the Hot Wheels line. The original Limozeeen introduced in 1989, Syd Mead’s Sentinel 400 introduced in 2002 and now the Unobtainium 1. 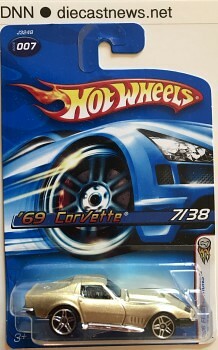 This 2006 Hot Wheels ’69 Corvette was released as part of the 2006 First Editions Series in 2006. Real Wheels:The third generation Corvette, patterned after the Mako Shark II concept car, was introduced for the 1968 model year and was in production until 1982. C3 coupes featured the first use of T-top removable roof panels. It introduced monikers that were later revived, such as LT-1, ZR-1, Z07 and Collector Edition. Variations: – YES – according to reference materials there are at least ten variants of this series/model. If you are looking for information regarding Hot Wheels variations please check out the books and guides we use as reference. FUN FACTS! – Did you know that there have been over 400 new models introduced since the 1996 First Editions Series? This article uses material from the “’69 corvette” article at Hot Wheels wiki at Fandom and the Chevrolet Corvette article at Wikipedia and is licensed under the Creative Commons Attribution-Share Alike License. Welcome to another edition of “Muscle Car Monday”, where each Monday we showcase a die-cast model that represents the spirit of the Muscle Car era – both past and present. Here, in our second entry, we present the ’69 Chevy Camaro Convertible, which was released in 2006 as model 6/10 in the 2006 First Editions Series! Real Wheels: The Chevrolet Camaro is an American automobile manufactured by Chevrolet. This casting is based off of the first-generation Camaro which went on sale in September 1966, for the 1967 model year, and was designed as a competing model to the Ford Mustang. The Camaro was built on a new rear-wheel drive GM F-body platform, and was available as a two-door coupé or convertible with 2+2 seating, and a choice of 230 cu in (3.8 L), 250 cu in (4.1 L) inline-6 or 302 cu in (4.9 L), 307 cu in (5.0 L), 327 cu in (5.4 L), 350 cu in (5.7 L), 396 cu in (6.5 L), 427 cu in (7.0 L) V8 powerplants. The first ’69 Camaro was released in 2006 and the model that we are referencing here. It was based off of the convertible version actual production model. The second ’69 Camaro was released in 2008. It was tooled from the first ’69 Camaro. It was based off of the hard top version actual production model. Variations: YES – according to reference materials there are at least eight variations of this series/model. Check out the books and guides we use as reference. FUN FACTS! 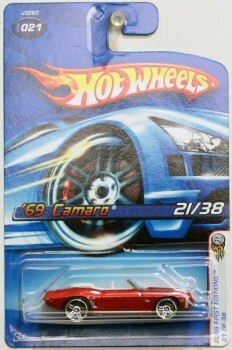 – Did you know that the background artwork on the 2006 Hot Wheels Poster is of the ’69 Camaro Convertible? This article uses material from the “’69 Chevy Camaro Convertible” article on the Hot Wheels wiki at Fandom and is licensed under the Creative Commons Attribution-Share Alike License.